In 2013, Charlottesville top seed Tim Smyczek was upset by #313 Saketh Myneni. Last year, as the #2 seed, he was stunned by Liam Broady. So it was no small matter that our good ‘Murecan’ Smyczek is moving on at the Charlottesville Challenger. He easily dispatched Great Britain’s Daniel Evans 6-4, 6-4 to advance to the second round for the first time here since 2012. He’ll meet Sekou Bangoura in the next round on Wednesday. Stefan Kozlov looked inspired and just a little tired in a comebacker against British foe Marcus Willis 4-6, 6-2, 6-2. After the match, Kozlov explained that with the win, he’ll be playing a match tomorrow for the 9th straight day. He jokingly chastised USTA Supervisor Keith Crossland for scheduling a doubles match with Frances Tiafoe for later in the day, and Kozlov and Tiafoe lost that match in straights. For Kozlov, he’ll face Colin Altamirano in the first round, a familiar opponent. But tomorrow’s prime-time action will feature Tiafoe, who might be set to score an upset against Malek Jaziri, the tournament’s top seed. About the license plate above. This is the actual license plate of the actual truck next to my parked car as I write. It is a symbol of pride. My only concern is that it might be an unfortunate misspelling of Merica like a botched neck tattoo. Twitter hashtaggery for #MURECA shows that foreign citizens commonly use this version and often to make fun of American foibles and bloopers. It’s the thought that counts, and the ‘Mericans/’Muricans/’Murecans are playing very competitive tennis early this week in Charlottesville. 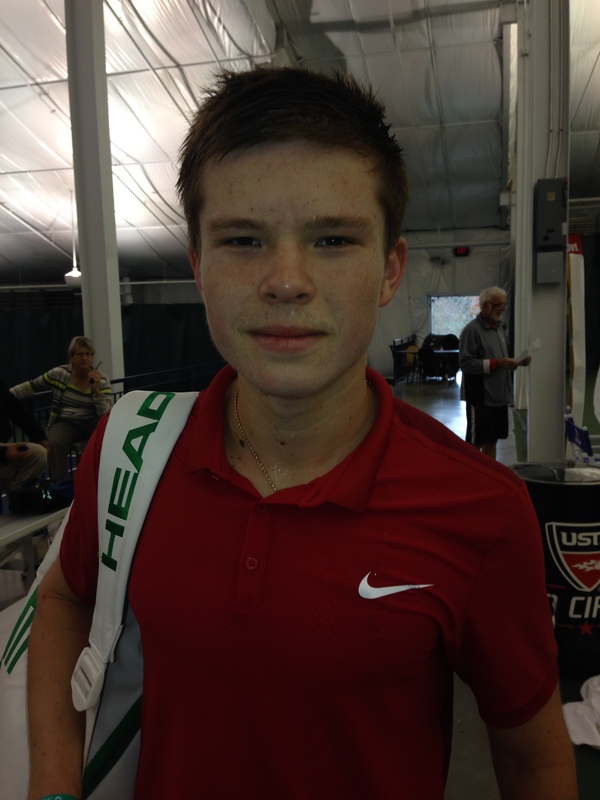 The Boar’s Head Sports Club Charlottesville, Va.
Henri Laaksonen, Switzerland d. Joshua Milton, Great Britain 6-3, 6-2. David O’Hare, Ireland/Joe Salisbury, Great Britain (4) d. WC-Stefan Kozlov/Frances Tiafoe, United States 6-3, 6-4.